Starring: Takeshi Kitano, Tadanobu Asano, Michiyo Ohkusu, Gadarukanaru Taka, Diagoro Tachibana, Yuko Daike, Yui Natsukawa. ‘Beat’ Takeshi Kitano made his name as a standup comedian before entering into cinema with a surprising array of serious and very violent roles. Here he tries to recapture the successful character who was a popular figure in Japanese film & television throughout the 1960’s to the 1980’s. Nineteenth-century blind nomad known as a gambler and masseur is also a lightning-fast master swordsman who stumbles into a town run by gangs and a powerful samurai. When he meets two geishas who are out to avenge their parents’ murder, the fireworks begin. I’ve never seen the very successful series of films or television program of which this is based upon, so i’m not in a position to compare but it doesn’t hinder the enjoyment of this visceral yet playful bloodfest. Kitano stages the whole yarn in a very theatrical style, with extremely exagerrated bloodletting, combined with an excellent soundtrack to fit with the rythmic moments and movements from the characters, like workers plowing the fields or rain pattering off an umbrella. 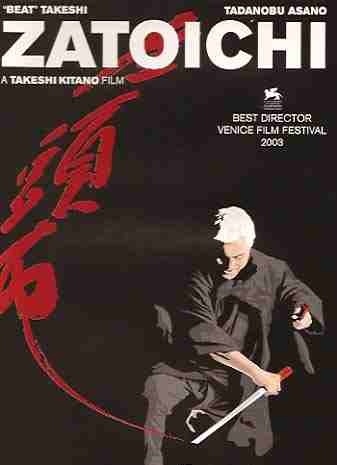 It’s beautifully shot and really captures the ingriguing Japanese culture with several stunning shots. As much as I admire the almost mystical and stoic tradition of the Japanese, I’m not the biggest Samurai fan, so the whole thing worked for me only to a certain degree. However, if your a fan of swordplay, then this will be right up your kimono. There’s no denying the visual style throughout this serene yet kinetic bloodbath. It’s like an eastern spaghetti western, but if your not interested in the genre then harikari may be a better option for you. This entry was posted on January 10, 2012 at 12:03 pm and is filed under Action with tags 2003. You can follow any responses to this entry through the RSS 2.0 feed. You can leave a response, or trackback from your own site.